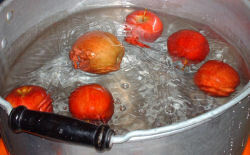 Then add the apples and let the kids take turns bobbing for apples. You could also use a large plastic "cauldron" rather than a bucket or tub. This game can get messy so its best played outside if possible. If you must play indoors, put down plenty of newspaper first. You should also consider protecting the children's clothes! Some children dont like putting their face in the water or dont want to mess up their Halloween make-up. If you think that might be a problem, tie the stems of the apples to varied lengths of string and then hang them up - from a clothesline, if you can be outside, or from a string suspended across your room (perhaps from door jamb to door jamb). The kids should then put their hands behind their back and try to take a bite out of the apple - which isn't very easy to do! You can also play the game using strings of marshmallows.